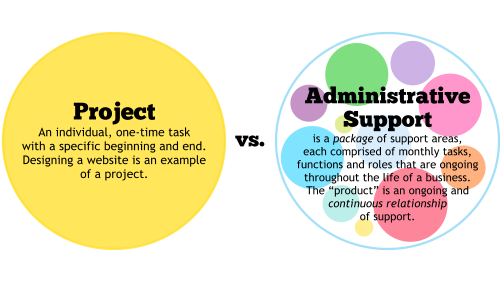 Do You Understand the Difference Between a Project-Based vs. 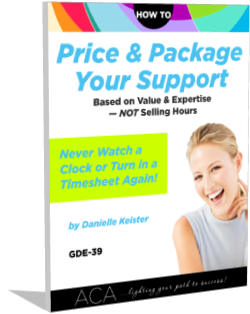 Ongoing Admin Support Business? When I started out (and didn’t really understand the concept of providing administrative support as a business), I was what is correctly termed a secretarial service doing one-off projects here and there where I could find them. Someone would hire me to do their resume, make a flyer or brochure, type some documents, that kind of thing. It’s equivalent to the business model of a print shop for example. A customer might be someone who only ever uses you once or it could be someone who is a repeat customer, but still on only an as-needed basis—occasional and sporadic. The problem as I discovered was it was a paltry income, nothing I could actually live on. It was pocket money at best, and I still needed to work a full time job to pay the bills. Okay, I thought, how do I make a living at that? There is no recurring or consistent income when a business is project-based. You never know where your next meal or client will come from or when. In order to make a living in a project-based business, it inherently requires that it be volume-driven, which comes with its own set of problems. In a project-based, volume-driven business, you have to CONSTANTLY be marketing and networking and ever on the hunt for your next project, that next not one but five clients, all while you still have work in front of you to do. It was a huge amount of work just getting those projects and clients I did have coming in here and there. It was this never-ending hamster wheel that left me little time to breathe. And to have to multiply all those efforts 20-fold? No way. That was NOT the kind of business I wanted. You also can never make up for in volume what you really need to make a living, not as a solo/boutique business. The answer would seem to be add more people doing the work. it would turn the work into an assembly line which is NOT what I want in my business or my life. I believe in artistry and craftsmanship in work product and that’s the quality I want to give to my clients. Churning work day in and day out as fast as possible (which is what you are forced to do in a volume-driven business) is NOT how I want to work or live my life. 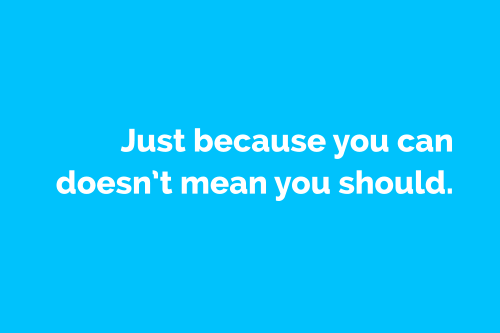 It’s not that a volume-driven project business can’t work. But it’s a much bigger and more difficult business to build and sustain. And it’s simply a different business model altogether, one I had not the slightest interest in. That’s when I started realizing that the way to make better money and more consistent income was to provide support as an ongoing RELATIONSHIP, not a one-off, piecemeal transaction. Once I got conscious about that, I started building a retainer-based practice where clients paid me in advance on the 1st of every month for ongoing administrative support in their business, not a project here or there. I took on specific areas and roles that were ongoing in their business. It was a lot more money—money I could actually LIVE on. It was consistent, recurring CASHFLOW. AND it didn’t require the constant merry-go-round of chasing after new clients and new work every minute of every hour of every day. I could live and work in a much more relaxed, sustainable, breathable pace, growing my roster slowly one client at a time. But I still had a lot of things to learn in my early years. I was still operating with the poor professional self-esteem that many in our industry suffer from: that I wasn’t enough, that admin support wasn’t enough. Part of the problem was I still didn’t really have a target market. And without that, I couldn’t really envision, much less paint a picture for prospects, about what admin support could look like in the context of their business and how it could help them in anything except the vaguest, most general (and uncompelling) terms. So I thought I needed to offer a lot more. I thought I had to DO everything, BE everything, and be ANYTHING a client tried to twist me into at their whim in order to be of value. First, I added web design. And then I thought bookkeeping would be a good service to also offer because who doesn’t need bookkeeping? What I failed to realize is that these are separate businesses in and of themselves. It’s a full time job to just to provide bookkeeping to a roster of clients. And design work requires a whole other part of the brain. It requires a switching of gears and lots of creative space that are simply too crowded when you are trying to do too many other things. Eventually, as I got busier and busier (without really ever getting too far in anything much less making any better money), I realized that I needed to focus on ONE thing, be in ONE business, not multiple businesses. Trying to be too many different kinds of businesses not only was keeping me from earning well, I wasn’t able to fully commit to any of them and was constantly distracted and pulled in different directions due to too many multiple focuses. That’s not a recipe for doing your best work for clients. I also realized that by focusing on ONE business (I got out of the bookkeeping business and then later discontinued doing any kind of design work completely), I did far better, more high quality work for clients, built my business faster, and ended up with far more discretionary time (i.e., freedom and flexibility) as a byproduct. All of which ultimately benefited my clients in a multitude of ways. I also realized (and look back now at how foolish I was back then) that if I had just gotten clear about being in ONE business earlier, I would have built my business and made more money so much faster. 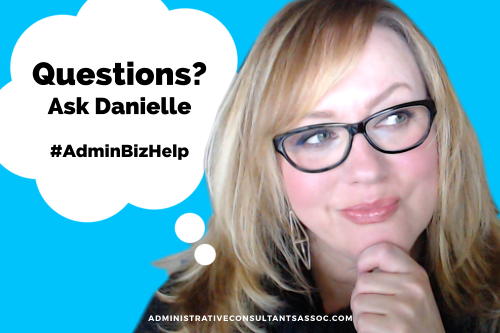 Because once I did, I also soon realized that by focusing on the ONE business (admin support), I didn’t have the time or need to do anything else. So now I’m VERY clear about what I’m in business to do and what I’m not. If a client needs something I’m not in business to do (e.g., you wouldn’t ask a plumber to fix your car), I point out that they need to talk to the professionals who are in those other professions. If I happen to know someone good, I will refer them. But I don’t bend over backwards making it my job to find them someone any more than it would be my doctor’s job to find me a lawyer. The only people who think that’s their job are those who are operating their business like an employee (or being trained to). 2 Comments Posted in Administrative Consultants, Business Planning, Earning, Financial Success, Growing Pains, Starting Your Biz. Bookmark the permalink. This post came about from a great conversation I was having over on our ACA LinkedIn Discussion Group with a colleague who was struggling with her target market. 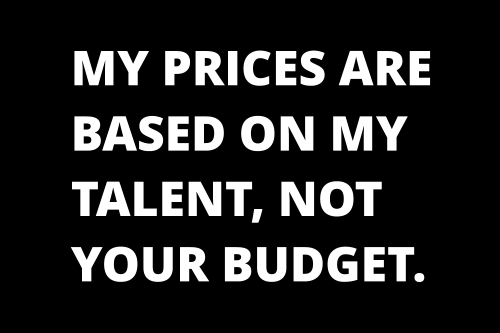 I see a lot of people in our industry erroneously thinking that the only clients who can afford them are large companies. But the size of a business (i.e., the number of people involved) has nothing to do with how much money it makes. There are hundreds of thousands of solos and boutique business owners earning multiple six and seven figure incomes while there are millions of bigger companies that are barely scraping by. What people fail to understand is that big companies don’t need us. They have the kind and level of workloads that simply require in-house, dedicated staff. Even if they are remotely interested in our type of solution, it’s typically only to get it as cheaply as possible. And you can’t afford to be in business to be broke. So there is a fundamental mismatch of values and priorities and needs. Being a solopreneur/boutique business owner is a lifestyle choice. It has no bearing on how much those businesses can and do make so don’t make the mistake of focusing on the wrong market. If you do, you are missing out on finding the RIGHT fit with those who actually VALUE what we do because they have more need for it, value the one-on-one relationship and, thus, are far more ready, willing and able to PAY WELL for it. 1 Comment Posted in Clients, Earning, Getting Clients. Bookmark the permalink. 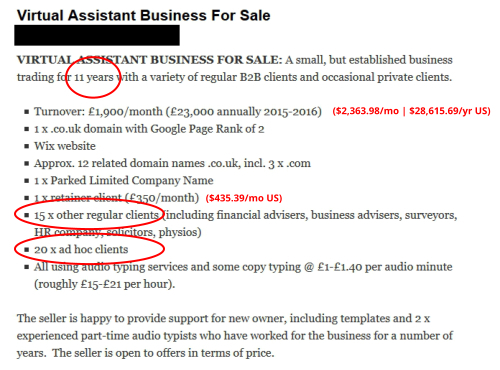 It’s not difficult whatsoever to get clients when you charge peanuts. The problem and real difficulty (extremely so) is dealing with the KIND of clients you get when you charge peanuts and being able to achieve a sustainable, profitable business, one that you can actually earn a healthy living from (as in, not just hand-to-mouth). To be able to charge (and earn) more and get better clients requires more in-depth learning and understanding about marketing and human behavior and psychology. And you aren’t going to get that from the simpletons and copycats. Because if it were as easy and simple as they would have you believe (because that’s how they get into your pockets), everyone would already be millionaires (or at least earning well into six figures). And we all know that’s not the case. What do you think? Leave a comment! Posted in Clients, Earning, Getting Clients, Getting Paid. Bookmark the permalink.